For a reprieve from the fast-changing and growing Seattle metropolis, follow Interstate-5 south along the Puget Sound, and head for the coast. The towers of Amazon, Microsoft and Google give way to evergreens; and log-stacked semis on the freeway replace the tech firms’ shuttles and zero-emission buses. You hope you don’t miss your exit because spotty coverage has made Google Maps worthless. By the time you reach Grays Harbor County, in the southwest corner of Washington, where timber and shipbuilding are the economic giants, you have just about given up on making calls or sending email. The device you were depending on is now merely a thin brick. Sure, it works in downtown Aberdeen. Good thing — you wanted to snap a picture of Kurt Cobain’s childhood home to your grunge-obsessed friend. But, in the span of a two-hour drive, what was once a smart tool in the city has become largely useless. In broadband-sparse regions like this, it’s hard to imagine how smart technologies could be woven into the rural infrastructure without major efforts to better connect these areas to the web. In recent years, urban planners and tech leaders nationwide have advocated to make our cities smart — to collect real-time data with sensors, and use this information to run cities more efficiently. In response, members of Congress representing Washington and New Mexico introduced the Smart Cities and Communities Act in 2017. If enacted, the legislation would allocate $220 million each year, for five years, to infuse smart technologies into the infrastructures of interested cities. Notably, it promises to bring these systems to small communities as well. Envisioning these devices in rural Washington — the state represented by two of the bill’s congressional authors — exemplifies how they might function in much of rural America. In places like Grays Harbor, it’s especially tough to see the function of many technologies created in tech hubs like Seattle. In fact, some experts say extending the smart cities concept to small communities might be a flawed proposition to begin with. What is a smart city, anyway? Throughout the nation, city leaders have teamed up with tech companies to collect data on anything from weather to energy and traffic, in an attempt to make their cities safer, healthier and more efficient. For instance, sensors on Chicago’s beaches constantly collect data on the levels of harmful bacteria in the water where families splash around. The information can alert officials to health threats, such as the presence of E. coli. In Louisville, Kentucky, health organizations including the Institute for Healthy Air, Water and Soil attached sensors to a thousand asthma inhalers. The electronic monitors tracked how many times people used their inhalers, and in which areas of the city. This data was used to identify asthma hotspots, so city officials can take steps to improve the air quality in these regions by, for instance, planting trees. Similarly, the sounds of gunshots in New York City are captured by ShotSpotter technology — a network of microphones placed throughout the city. The sensors usually beat 9-1-1 calls at letting police know when and where a gun was shot so that they can respond more quickly. Some leaders envision cities structured entirely using projects like these that integrate technology into daily life. And some legislators are on board too, expressing optimism about the future of smart city projects, even in places that aren’t urban. “Smart infrastructure has the potential to make our communities safer, more efficient, healthier and more sustainable. But these advances shouldn’t just be reserved for major cities and Silicon Valley,” said Representative Ben Ray Luján, one of the bill’s sponsors, as quoted on the website for the U.S. Senate Committee on Energy and Natural Resources. If it becomes law, the legislation would provide grants to cities and communities for smart technology projects. An online guide would describe best practices and provide examples of smart technology in communities that have already embraced it. And to ease the implementation, additional grants would fund job training to help locals learn how to build out the projects. The bill also includes efforts to integrate these projects in less populous regions. “Budgets in small communities are tighter,” says Ramsey Cox, communications director for bill co-sponsor Rep. Suzan DelBene. And that makes local leaders more cautious. Small communities want the smart technologies cropping up in larger towns and cities, she says, but there’s “hesitation to invest in something unless it’s tried and true.” Grants would reduce that risk, Cox says. Transplanting city-centric programs to small counties is a hefty goal when you consider that no true smart city has yet been built. “Most so-called ‘smart cities’ are just cities with a few or several standout smart projects,” Kendra Smith, of the Center for Population Health Sciences at Stanford University School of Medicine, wrote in a recent essay. She expanded on this point in a phone call: “The idea behind smart cities is really neat and cool and innovative. But there are lots of obstacles to overcome.” Smart city initiatives cost billions of dollars, she says. After the initial investment, sustaining the technologies can become an ongoing struggle. Smith wonders, who’s going to continue to pay for them? Equity in smart cities is another concern Smith addresses. Based on a review of the past two decades of research about smart cities, many researchers share her worry. The concept derives from private companies and government and industry leaders, according to city and technology researchers Igor Calzada and Cristóbal Cobo in their 2015 paper. Such a top-down approach, they say, is likely to leave portions of the population behind. Let’s suppose it’s possible to build an equitable and sustainable smart city, wherein traffic, health and policing are all directed by constant data collection. Extending this to small communities is a whole other beast for one very important reason: internet access. 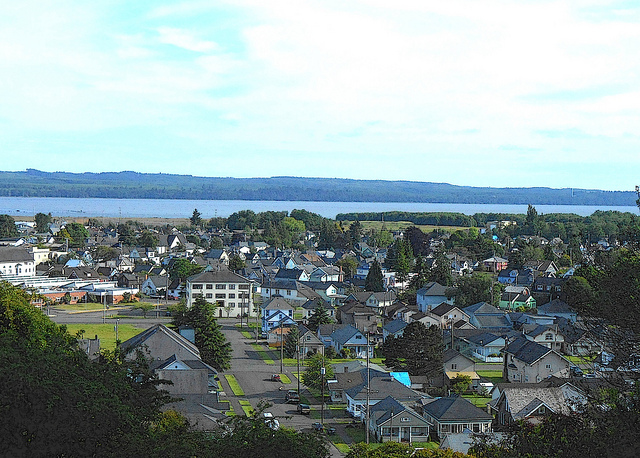 “Before you can have a firm conversation on deploying the internet of things [a genre of smart city technology], there needs to be a robust conversation on broadband,” says Joe Meyer, the Marketing and Business Development Specialist for Grays Harbor’s Chamber of Commerce. In Grays Harbor, you’ll probably have an internet signal inside Hoquiam High School, or while eating burgers at the Grizzly Den, but outside these areas of the county, access is less reliable. It’s potentially a big challenge to infuse small communities with smart technology, which relies on sensors’ capacity to send data to computers quickly and constantly. The long-term outcome for all smart communities is uncertain. Broaching concerns about broadband in small communities, and smart cities in general, starts with the success of the bill, which tech consultant and author Anthony Townsend described as likely dead on arrival. A tool that predicts the success of legislation using artificial intelligence gives it a 4 percent chance of becoming law. The bill is still relatively new, though — if the smart cities movement gains political momentum, things could change. Until then, local leaders and proponents of the smart city dream alike will have to carefully consider the obstacles ahead. In Grays Harbor, where you’ll spot fisherman lining Chehalis River all spring long, where paychecks are often earned by packaging crab meat or sawing down trees and where the poverty rate is 5 percent higher than the state average, federal grant money might be a godsend — unless the grants are primarily designed to serve the tech metropolis up north.